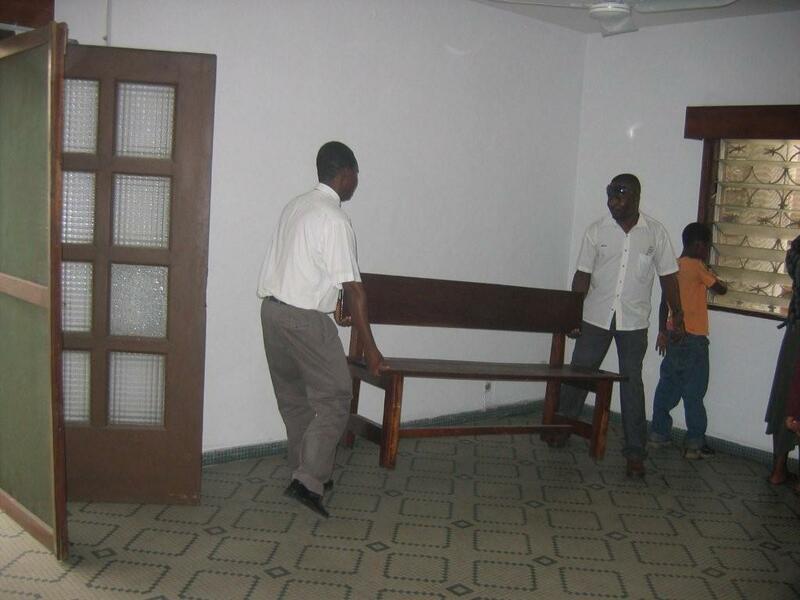 The Cotonou Branch of the Church no longer exists. Last Saturday and Sunday, December 20 and 21, President Ayekoue interviewed over 20 priesthood holders, disbanded the Cotonou Branch and replaced it with the Gbedjromede Branch, the Menontin Branch, and the Akpakpa Branch. We have a little catching up to do on the blog after last weeks Christmas message. Things have been happening at a furious pace. President Ayekoue came on December 18th and stayed with us until Monday the 22nd. That in itself is an experience. Sister Ayekoue broke her foot and was not able to come the last two visits but this time she came along with little Happy. She is still not able to get around well and moving about is somewhat difficult and time-consuming. Soeur Black was a little challenged between taking care of Sister Ayekoue, taking care of Happy, and keeping all of us fed and also happy, but she did a magnificent job and all went well. We had our zone meeting and dinner on December 18th when President and Sister Ayekoue arrived. I went to the border and picked them up while Soeur Black stayed here and prepared the zone dinner for when we got back. After dinner we had the zone conference here in our apartment. On Friday, President Ayekoue interviewed missionaries and then started interviewing branch members in the evening. That continued through Saturday and then on Sunday the old Branch Presidency was released and the three new ones sustained in the Branches. The branch was officially organized in February of 2003 so it has been a little less than 6 years now going from just a handful of members up to now over 225 and 3 branches. We are excited about that. The division doesn’t end our work by any means. In fact, I think it may just be starting. We now need to get bank accounts opened for the new units, divide records, find new physical facilities and get them equipped, train new clerks and do at least 100 other things that seem to keep cropping up. We have also been trying to help the old branch clerk get the tithing records reconciled for the year, and that has been taking a lot of time. Saturday evening was the branch Christmas party. For some time now the Primary and the Youth have been practicing up to present some drama productions and songs for Christmas. It was wonderful. The chapel was filled to overflowing. The primary kids sang songs and presented some readings about Christmas, then the youth took over with drama and more songs and the branch choir also helped out. It was a program that would be a credit to any ward we have at home. It’s hard to describe a program but we will send some pictures which we hope will speak for themselves. Afterwards, the Relief Society served rice and chicken, which seems to be the main refreshment for any proper celebration. Sunday was also Sister Ayekoue’s 35th Birthday so Soeur Black fixed up a cake and most of the missionaries came over on Sunday evening for cake and ice cream in honor of the event. After Sunday we kind of forgot about all the branch division and such since Christmas was upon us. President and Sister Ayekoue left on Monday, and on Tuesday we prepared all day to have the missionaries over for our Christmas Eve dinner and party. We would have had it on Wednesday but Elder Foucher was leaving late on Tuesday to return to France for Christmas so we had it a day early and made it also a going away dinner as well. Soeur Black had the tables decorated up nicely and we had a wonderful dinner of chicken and rice. I think it was a first for many of the African elders. 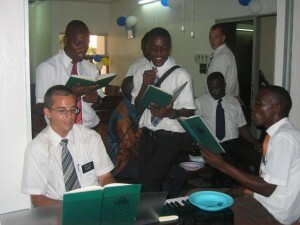 The elders played the keyboard and sang Christmas carols while we were finishing the dinner. Afterwards we had some little gifts for everyone and played the gift game where you can either open a present or steal one from someone else in which case they get to open another. Everyone including us enjoyed the evening. We will miss Elder Foucher. He has been a very good missionary and understands the scriptures and church doctrine well. 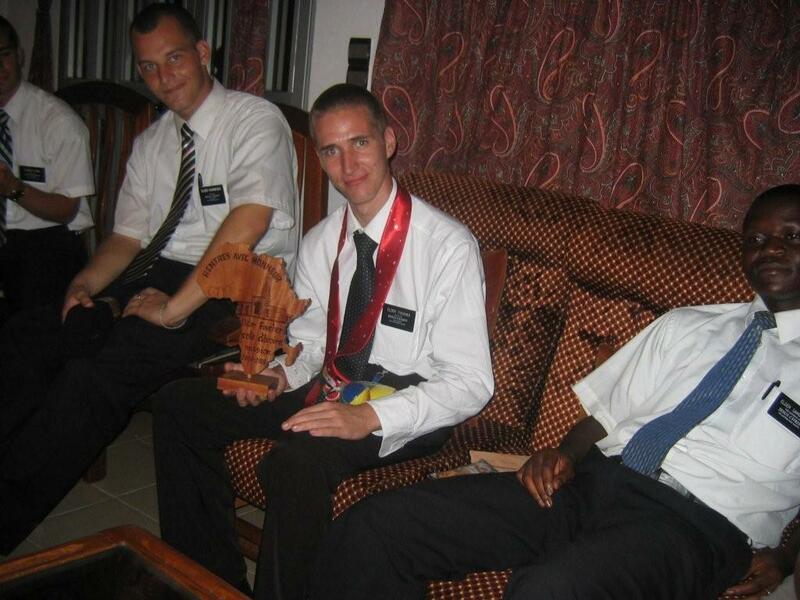 We gave him a little wooden plaque of Africa with the Ghana temple burned onto it as a going away gift. With Christmas out of the way on Tuesday, Wednesday was rather quiet except that the new Branch Presidencies had scheduled a meeting on Christmas Eve so I went over and met with them for a while. I encouraged them to disband as soon as possible and I came home and listened to Christmas Music with Soeur Black. 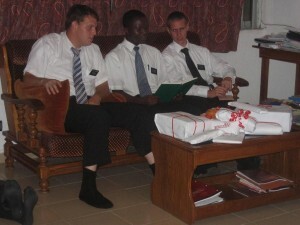 Christmas day we had the missionaries over again for telephone calls with their families. We have the only phone in the Benin missionary work that is not a little cell phone so Soeur Black made up a schedule for all the missionary parents with a time to call our phone to talk to their missionary. 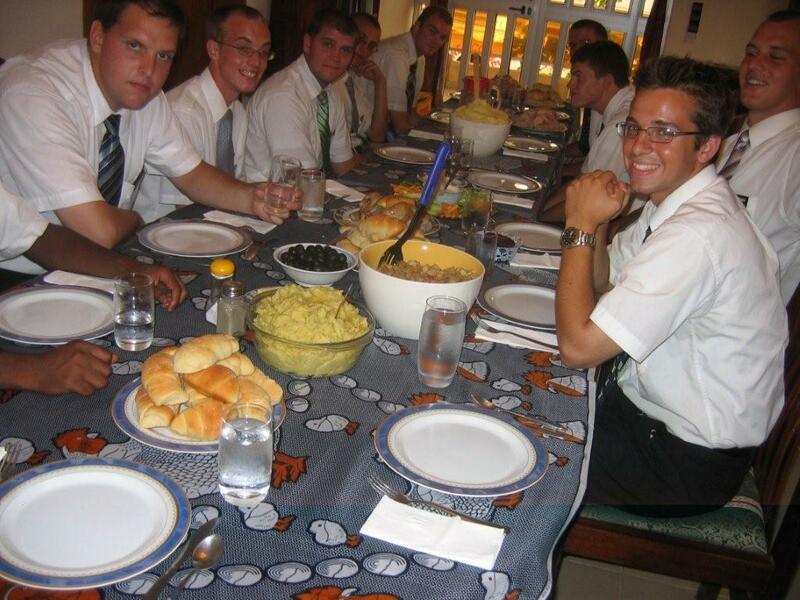 It was actually quite a task considering all of the time changes from Africa, Europe, the US and Canada but it went off like clockwork and all the missionaries got to talk to their families. During the day, Soeur Black prepared an all-day breakfast buffet for everyone to eat as they talked or were waiting to talk to their families. Later on it was our turn to talk with all of the kids and grandkids which was the highlight of our Christmas. Thus ended our one and only Christmas in Benin except that on Friday, we went around with a family in the Branch that had invited us to go with them and visited several people, took them a Christmas cupcake and sang them a Christmas carol. 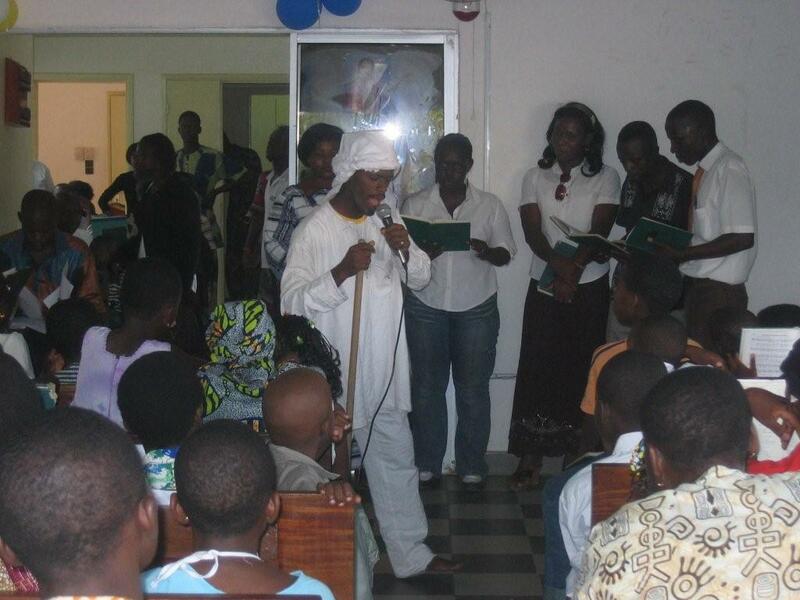 The other event of the week was moving into the Akpakpa chapel on Friday and Saturday. As mentioned before, we have a house there that serves as quite a nice meeting place with 4 or 5 classrooms on the bottom and the elders live on the top floor which is accessed by an outside stairway. It is well situated so almost all the current members can walk to church. It required quite a bit of cleaning and preparing but the members pitched in to clean and we found a truck we could rent to move some benches and other fixtures from the existing chapel so by Saturday night all was ready for Sunday meetings. I guess we are getting used to things as they are in Benin but the Christmas season again impressed upon our minds how much we have to be thankful for and how very little the people over here have. There were a few decorations here and there and some of the larger stores were somewhat decorated for the event. Those stores are mostly frequented by white people and richer Africans. For the average family, there were no decorations, no tree, and certainly no presents. The City of Cotonou did put up a few stars that looked more like 4th of July than Christmas but I guess that was okay since firecrackers have also been going off regularly as part of the Christmas celebration. Chickens appear to be popular for Christmas and the holidays. All over town there are improvised chicken coops full of chickens for sale for the holiday. Soeur Black wasn’t too excited about buying chickens on the hoof so we opted for getting some frozen ones at the super market and also bought a few extras which we took around to a few people we wanted to wish a Merry Christmas. We are glad we got to spend a Christmas in Africa. We are also glad we will be home next Christmas and be sure to enjoy friends and family even more as we remember our friends here in Africa. We wish everyone a very happy new year. As missionaries, we live closer to the teachings of our Savior Jesus Christ, so, with fewer distractions this year, it is easier to keep Christ in Christmas. When Luke recorded in Chapter 2 verse 11, “For unto you is born this day in the city of David, a Savior, which is Christ the Lord,” it was a new beginning leaving the law of Moses behind and ushering in the fullness of the gospel. Christ taught us how to live, how to treat and respect others, the joy of service, how to organize the church and even resist temptation. Most of all, through His atoning sacrifice we have the opportunity to repent and live with Him once again. We miss all of our family terribly but at the same time, we are so grateful for the knowledge that family bonds extend beyond this life because of the message we celebrate at Christmas, the same message we have the privilege of bringing to some of these people who have not been as fortunate as we have been. We have been thinking of the humble characteristics of our Savior and how they can be applied to our own lives. We urge each of you to take a few minutes with your family and make a list of Christ-like attributes that you love and will try to emulate. These are some that are important to us: Christ was no respecter of persons. He taught all who would listen. He healed the lame , the lowly and despised. He loved little children the elderly and all those in between. He taught simply so those who were receptive of His message could understand. He showed no bitterness to those who persecuted Him. He showed appreciation to those who were His followers. He cared about His earthly mother. He spoke kindly and lovingly. Everything about the Savior of the world, from being born in a stable to being buried in a borrowed tomb was humble and lowly, yet his life and teaching have affected more people in more profound ways than any other man who has ever lived on the earth. 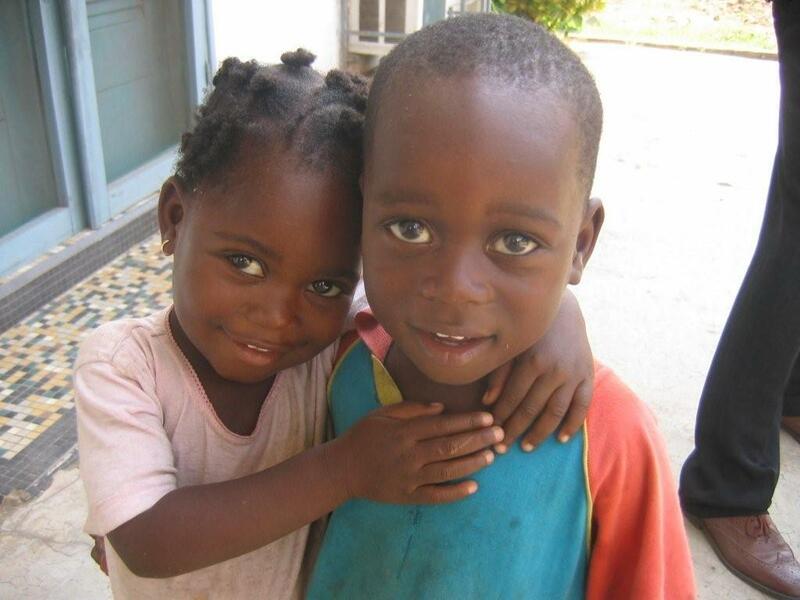 We love and appreciate all of you and the strength we feel from your support and encouragement while we are in Africa. Life is hard here, not so much for us but for those who live here. Here, there are few decorations, lights, Christmas trees, or gifts for exchange. Christmas is just another day to try to find enough to feed yourself or your family and to keep a roof overhead, however shabby that roof may be. Christmas in Blanding surrounded by family, friends and abundance will never be the same for us. While we enjoyed it so very much before, we will remember from our experience here in Africa to be sure to enjoy it even more in the future and to always be grateful for what our Lord has given to us by his life and his death. We found out more about that goat market we told you about two weeks ago. 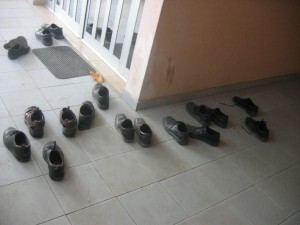 The Muslim people celebrated Tabaski on Monday. We don’t know a lot about that holiday except that it seems to involve feasting on goat meat. All over the city on Monday morning there seemed to be a somewhat ceremonial slaughtering of goats. As interested observers, we could tell that there was a definite way in which each goat was slaughtered as they were all processed the same way. After the initial killing each goat was inflated and shaved, the insides cleaned and the head roasted over an open fire and the meat cut ready to be cooked for consumption. Most of this was done on the sandy streets so we got a good chance to observe. We later found out that Tabaski is a Muslim holiday in observance of when the Lord asked Abraham to sacrifice his son, Isaac, and a ram appeared and took his son’s place. The tradition is to slaughter a goat in the prescribed way and then to eat and also give meat to neighbors. In some areas, I guess there are some hostilities between Christians and Muslims but here in Cotonou it appears there is respect for the beliefs of others. All of the Muslims we have become acquainted with seem to be good people. The entire city of Cotonou semi-stopped in respect for the Muslim community holiday. You could actually drive on the roads but when we tried to shop we ran into problems with stores closed. I did have one member call to ask if it was okay to accept goat meat from a Muslim neighbor. I told him it would probably be okay if you remembered to thank him. We went to President Briga’s, the Elders Quorum President’s home for home evening on Monday night. We were late because of the horrible traffic jams between our apartment and theirs. When we arrived it was after dark and after opening the big metal door into their courtyard, we could hear the little family singing hymns with a CD playing for accompaniment. We felt the spirit of our Heavenly Father so strong and it really was a great beginning to another wonderful home evening. We talked about the importance of marriage and families and how families can be sealed in the temple in order to be together for eternity. 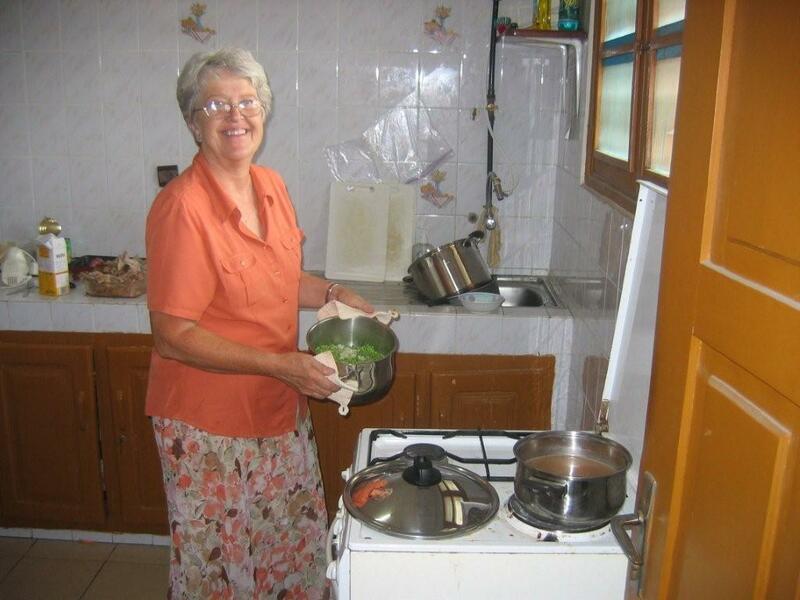 Helene Briga is not a member of the church but has been coming with her husband lately and has decided that she would like to learn more about the gospel. We are really excited about that! 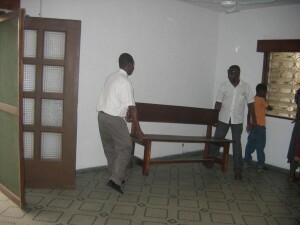 Since there is no Cote d’Ivoire Consulate in Togo for the Togo missionaries to get a visa, it was back to the border to get Elders Carter and Lee early on Tuesday morning so we could get the necessary paper work done in time for them to have a visa by Thursday. 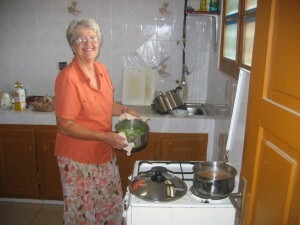 They were happy to come since they both worked here and knew many of the members and missionaries. 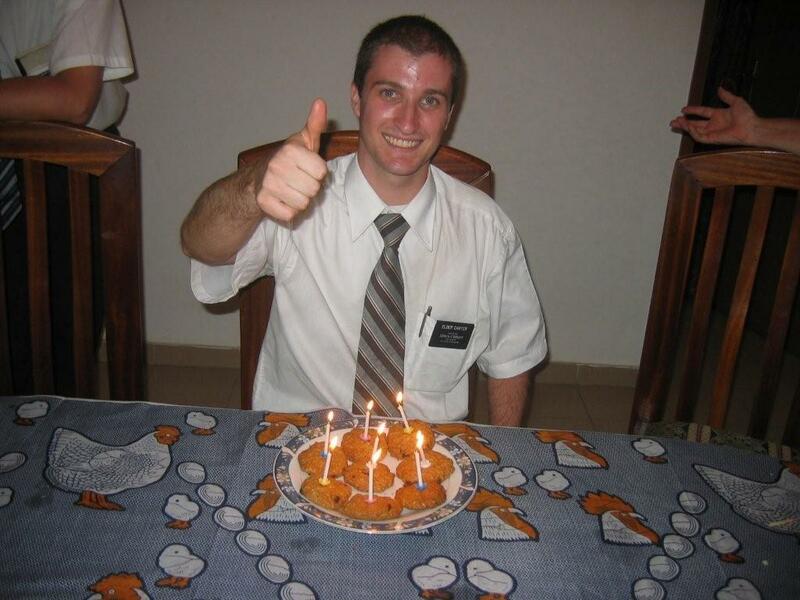 Elder Carter casually mentioned that Tuesday was his birthday so when the elders were at the Cote d’Ivoire Consulate, I fixed a quick birthday dinner. There was no time to bake a cake but I did have some cookie dough in the freezer, so I baked a batch real fast and put a candle in each one and we sang “Happy Birthday”. First time I served a birthday cookie with candles! Thursday was the big transfer day. 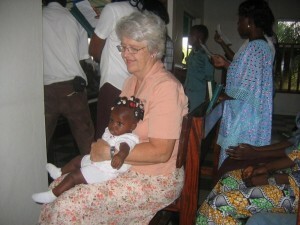 We put 4 elders on the airplane for Ivory Coast and received two more here so we spent most of the day at the airport. Now that all of our transfers have finished, our count is as follows: Africans 4 (Elders Samutamu from Congo and Elders Ahoutou, Teti and Gondo from Ivory Coast; French 2(Elders Foucher and Fontaine); American 3 (Elders Skouson, Schwieger and Bowman); and Canadian 1 (Elder Olsen). Seems like we have transfers almost every week any more. Next week Elder Foucher finishes his mission just in time for Christmas, and President says to send Elder Olsen to Togo. I had a difficult time accepting President Ayekoue’s decision to transfer three of our best missionaries just before Christmas, but the work is more important than my personal wishes. Saying goodbye and obtaining visas took most of our time for the next two days. On Wednesday, we were able to go to Calavie to see Soeur Julianne and Josianne. Elder Carter knew them so was eager to go see them before leaving on Thursday. 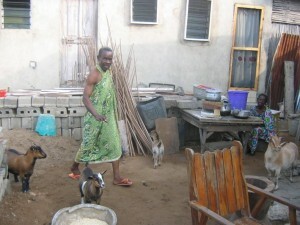 We like to go to Calavie and leave the city of Cotonou for awhile. The road is under constant construction, so getting there is quite the challenge as there are motos, cars, semis, buses and people everywhere and with the detours, you know that the trip will take and hour instead of half an hour. 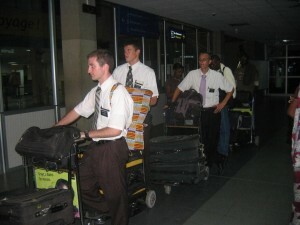 By Thursday night the four elders were weighed in and ready to go. 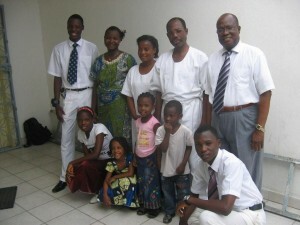 We retrieved their replacements, two missionaries who were transferred from Cote d’Ivoire, also on Thursday. Thursday was definitely our airport day! Our four missionaries had ambivalent feelings about leaving investigators and members here in Cotonou but were packed and ready to go. We were all a little serious at the airport, though. We also got in a little teaching time this week. A couple of weeks ago, Elder Foucher and I were trying to get an extra set of keys made for his apartment. The place that was supposed to make them was closed so we followed some leads of where people told us we could get one made and finally ended up at a home in back of some other homes that didn’t look much at all like a key shop. The lady told us that their key shop was just up the street. When we tried to pin her down as to where it was exactly it really didn’t make sense, but she said it would just take a few minutes to walk there and she would send her daughter to guide us. Okay. After a 20-30 minute walk, we finally arrived at a key shop and got the keys made. There was a Jehovah’s Witness brochure on the table that Elder Foucher dissected a little as we were waiting. When the guy came back I asked him if he were JW. He said no, that they had just been by and left a brochure. 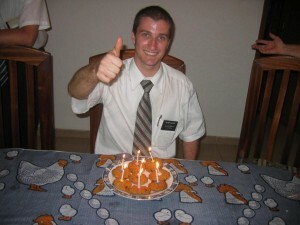 I told him we were missionaries and would like to give him a message. To make a long story short, since then he and his wife have not missed church and have been meeting with the missionaries regularly. They are interesting people. 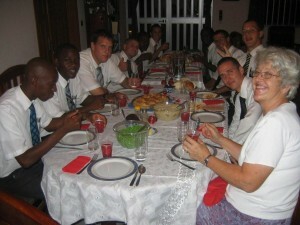 We went with the missionaries on Friday and met with them. Their surroundings look like they are the poorest people in Cotonou but they actually own quite a lot of land and have a good business. Seraphin dresses kind of like Mahatma Gandi most of the time. The goat in the picture (on the right) is Philomen. When he calls her name she answers with a Baa-aa-aa. They are interesting folks and will make good members if they continue to progress. 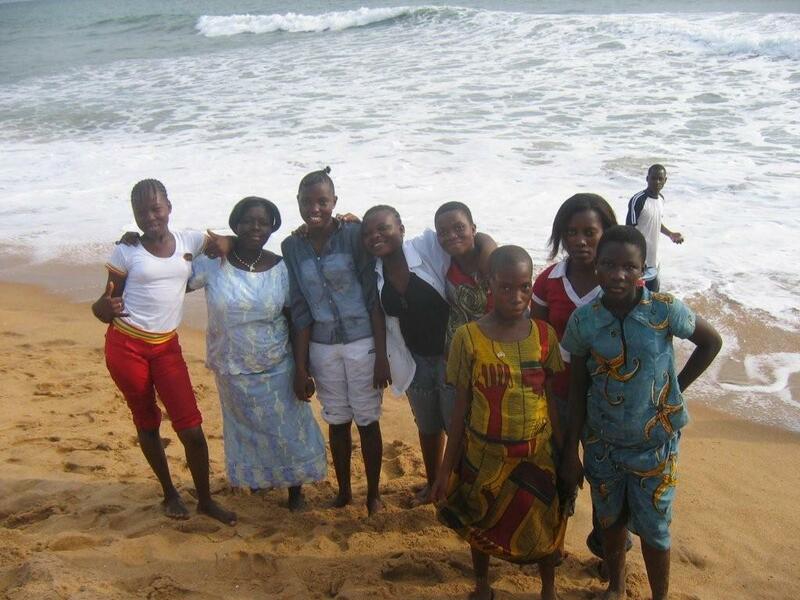 Saturday the young women’s presidency asked us to help them take the girls to the beach. We agreed since we had suggested they might do that earlier as a good activity for the girls. There is always a problem of supporting local leaders in their decisions and guiding and directing how things go a little. We arrived at the beach ready to play and have some fun. The young women’s presidency, however, didn’t exactly have that vision. We should have seen that coming since the people here have little leisure time unless they are unemployed and then they have too much. The presidency had prepared a lesson and had all the girls sit in the sand, had prayer, sang a hymn, said another prayer, moved into the shade and commenced a fairly long lesson on talents. By then Soeur Black was getting a little nervous. When I got a minute, I finally suggested that perhaps Sunday would be a good time to complete the lesson on talents and perhaps we could now go over near the water and enjoy the beach. That appeared to be an entirely new concept but they finally agreed and we all went over and enjoyed outrunning the waves, playing in the sand and generally having a good time. 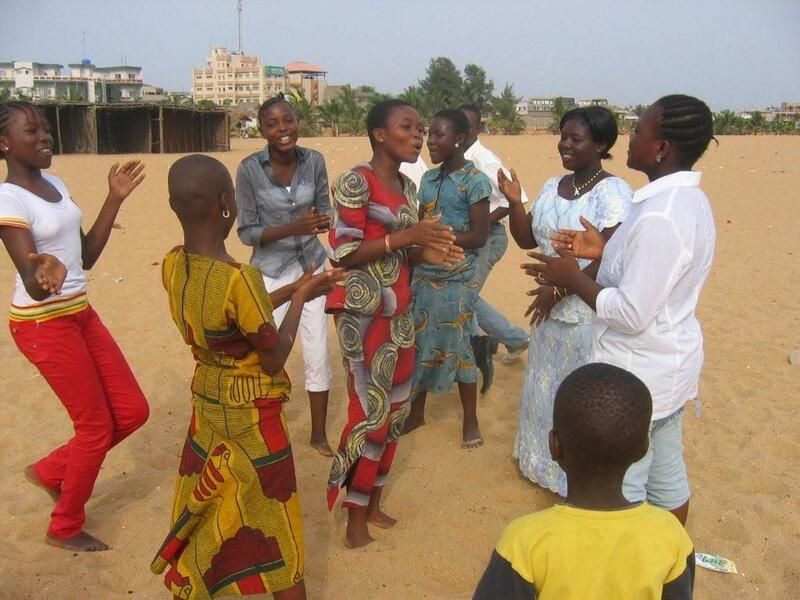 Afterwards the girls started dancing in the sand and enjoyed themselves a lot. Rhythm and dancing comes standard in the package of these people. It is just as natural as walking and as fun for them to do as it is for us to watch. On Sunday the branch presidency made the announcement that the Branch will be divided next Sunday when President Ayekoue is here. After a lot of work and a long time it is finally going to officially happen. Our problems now is that it will only create a lot more work for us. We are still on a great search for suitable sites for suitable chapels. 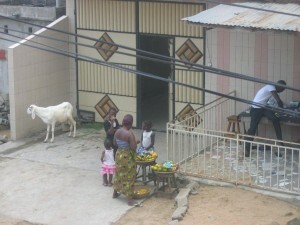 We thought we found a perfect large building by one of the main roads in the Menontin area of Cotonou. We made arrangements with the owner to view it on Wednesday but found out it was basically a fourplex apartment building — no room large enough for a chapel really without considerable remodeling. Many buildings have a guardian on the grounds for maintenance and security and this one was no exception. The guardian had twins, a little boy and girl who were absolutely adorable. Not only were they cute but they also were best friends. We just couldn’t help but include a picture of them. 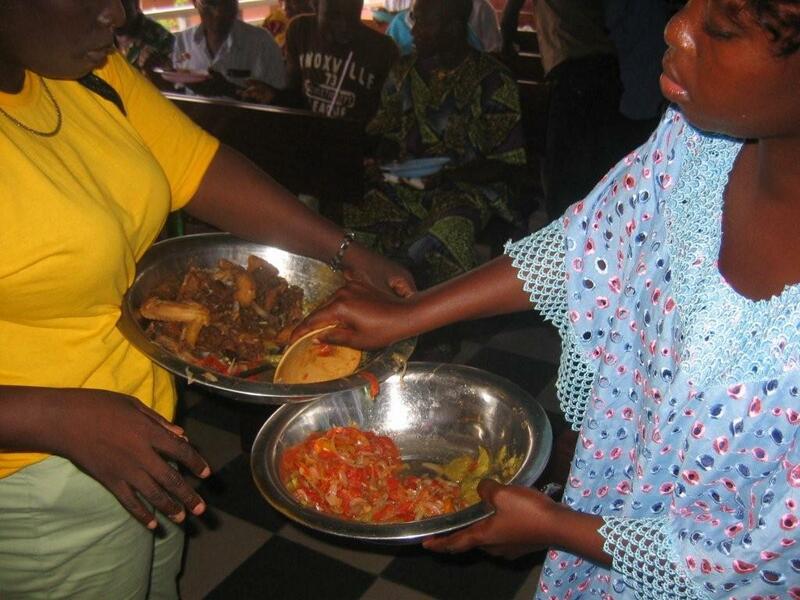 Thanksgiving was alive and well in Cotonou on December 1. The elders wanted it on their P-day so they would have longer to enjoy the meal. 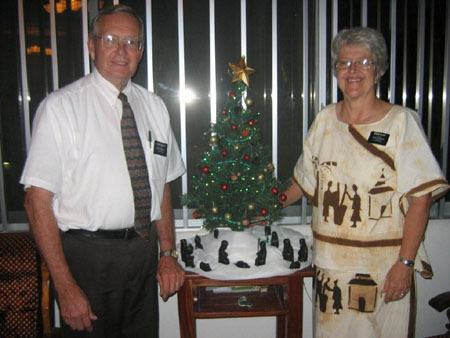 They take really seriously the missionary schedule and work when the schedule says work. It took a little preparation and determination on my part to make it happen, but thanks to Jody and the Findlays we managed to come up with a close facsimile. Jody sent pumpkin pie items and Findlays brought dressing mix and cranberry sauce. We bought chickens but finally found a frozen turkey from Brazil, which definitely was not a Norbest tender timer as it was very salty. It disappeared quite quickly, though. Elder Fontaine brought to our attention that “potat doux” was a sweet potato so we were excited to find them readily available and bought a sack full for the equivalent of about $1. The outside looked like a normal sweet potato but the inside was a different story as when they were cooked they turned a nice color of green. The first time we have had green sweet potatoes for Thanksgiving dinner. Monday morning Elder Loveless came in our apartment and said, “Do I smell rolls? It smells like my grandma’s house.” That was a good compliment and I reminded him that I was a grandma, too. The little postage stamp oven was in full service for about 8 solid hours before we could eat. Before we surrounded the table, we took turns expressing our gratitude for our blessings. The elders expressed their love of the people here and how they have witnessed miracles in some of their lives after accepting the Gospel of Jesus Christ. They expressed their love of the Lord and the love of their missions here in Cotonou. My gratitude of the small things in life has been magnified. I have a greater love for and appreciation of missionary service. I also love the beautiful promises given to us in the scriptures about our eternal salvation. Expressing our gratitude for our blessings compensated for the separation I felt during a time when the family was together. Soeur Black did an excellent job of finding suitable substitutes for items which are readily available where we live but which are not easy to come by in Africa. Other than a few minor blips it was just like a good ol’ American Thanksgiving dinner. I think the African and French Elders also enjoyed it. Soon after, during the week Soeur Black started to inventory the Christmas decorations. There have been a few things left here in the apartment by various other couples and missionaries and we found a little artificial tree about 2 feet tall which Soeur Black put into a round bottom clay pot she thought would be suitable for a Christmas tree stand. The pot was supported by a wrapped up African headdress. We originally put the tree in our bedroom but unfortunately during the night the fabric of the headdress sagged a little and the clay pot and Christmas tree rolled off on the tile floor breaking the pot, scattering the tree and almost scaring us to death. Oh well, at least we have a start on Christmas. It is a little difficult to get the Christmas spirit when it is hot and sweaty outside but it is December and we decided we had better get on with the celebration. I downloaded a lot of Christmas music on the computer before we left and we have been playing that some as well as. That mostly just makes us homesick but we will get by. On Saturday Elizabeth Lokossou was baptized. We have included a picture of the Lokossou family. The two on the right are brothers. Rogotian (far right) is a retired banker serves as first counselor in the Branch Presidency. He also helps us with apartment contracts and other matters and is always willing to help wherever he can. Joachime his brother is the father of all the children including Elizabeth from a previous marriage. He is a retired police officer. The whole family are really solid in the church and do a lot of good. Urbain, the boy on the far left is getting ready to go on a mission next year as soon as he finishes some schooling. Sister Lokossou (next to Urbain) is a real character. Whenever she is around there is always laughter and merriment. The family went to the temple and were all sealed when Southams left last June. Other than that, the week was mostly spent getting visas for missionaries and getting them transferred to and from Ivory Coast, the details of which are not all that exciting. Elder Loveless’ replacement is Elder Ahoutou from Ivory Coast. He is the only member in his family and has been a member about 5 years. We are looking forward to getting better acquainted with him. We were glad to be finished with transfers and looking forward to a better week. 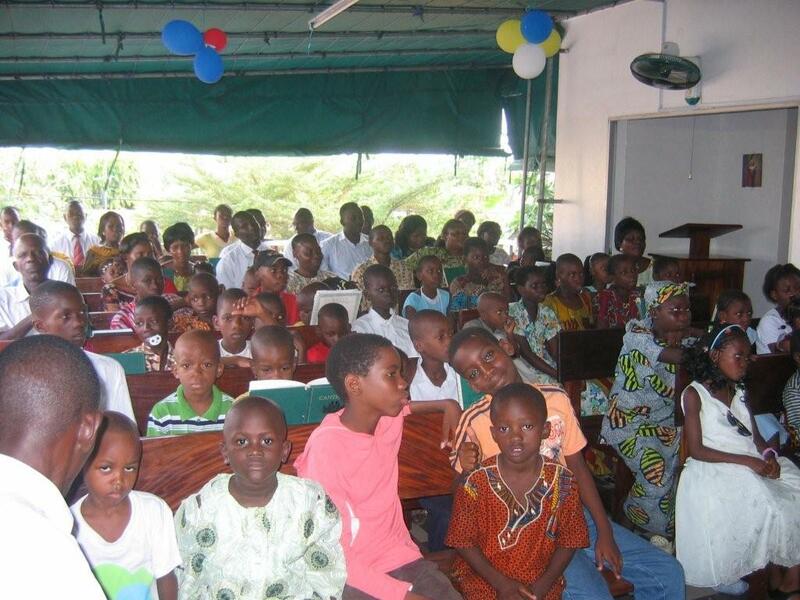 On Sunday morning, we had an e-mail from President Ayekoue asking us to send two more of our best missionaries to Ivory Coast along with two from Togo. So we have another week of about the same as last week. Elder Crooks and Phillips are our two district leaders and have been in Cotonou ever since before we arrived so we are really going to miss them. We gave them the news on Sunday morning since it was Fast and Testimony meeting and tears were shed in the meeting by missionaries and members alike. I guess that is all part of missionary work. They will do a great job in Ivory Coast until they finish their missions in March.